That is a nice setup. The friction drive wheel will ensure minimal shock to the drive line. 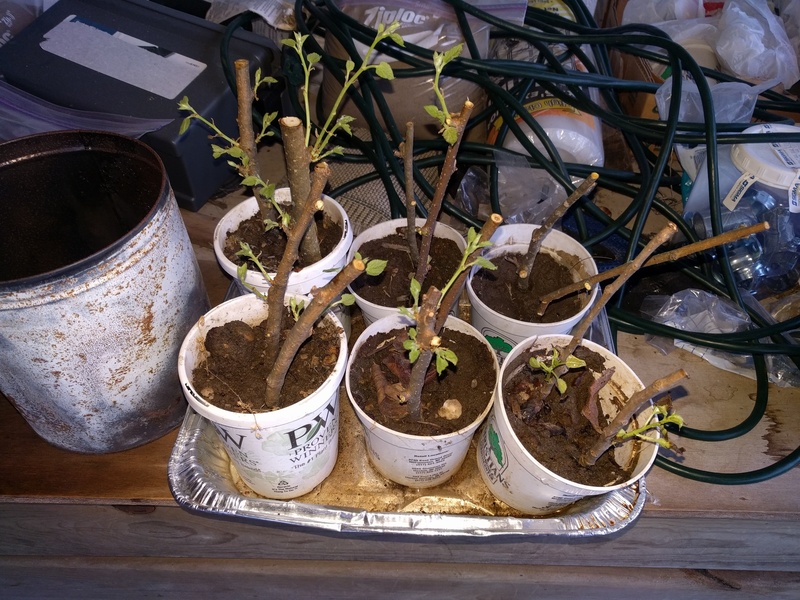 Now that is planing ahead… I would suggest using the mulberries for fruit instead of wood though I really like my mulberry Jelly. 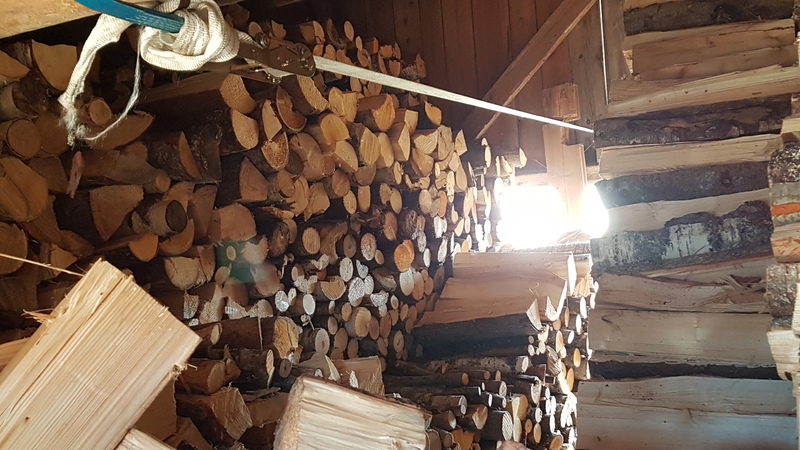 It is hard to get a good angle on that old wood shed for a photo but I am finally making progress filling it for the first time since I have been back here on the farm. I came back in 2013 so it has been too little wood for a long time now. You can see that the back 7 rows of the shed where empty down below the floor. That goes down about 4 feet I dug a deep hole. I pulled up old news paper bits from about 1906 when I was burning below the shed floor. The only good part of that was it got a hundred years of critter stink out of the shed and is much nicer in there now. There are 4 long rows that hold 1.3 cord each and then 6 short rows I don’t know the actual amount for them as the stairs come out of the end of those rows. There is also an old walkway on the other side of the stairs which went to the old outhouse. So the short rows are a lot shorter. But the shed holds something like 12 cord above the floor and I don’t know how much it took to fill that 4 foot hole but it seemed endless. 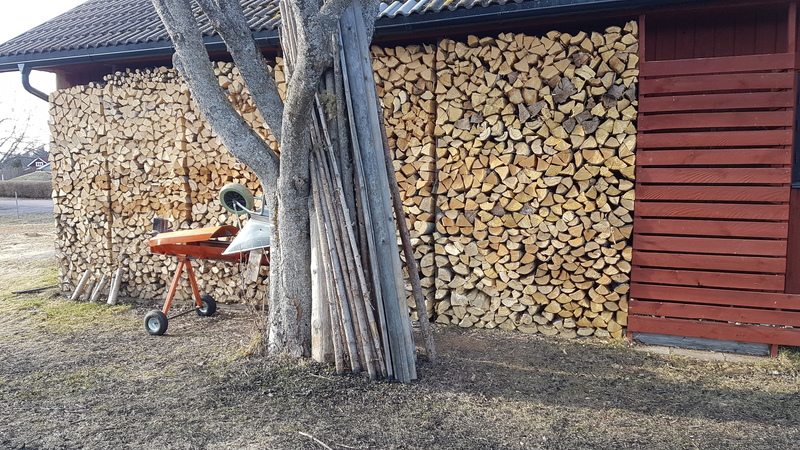 Ofcourse the fact that I have been cutting this years wood at the same time I have been trying to fill the shed hasn’t helped. Anyway it felt good tonight to finish off the last little bit of a step down and to start the 3rd row I will need to stand on to finish filling the first two rows. 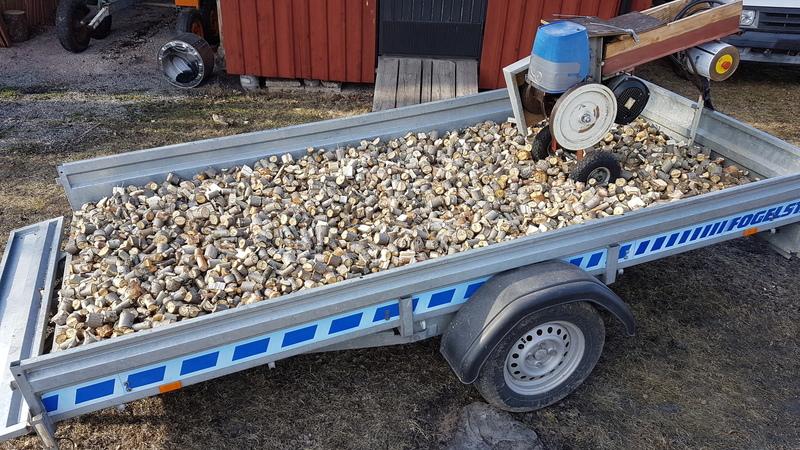 This is the point where you start to see the effect of every pickup load you bring in. 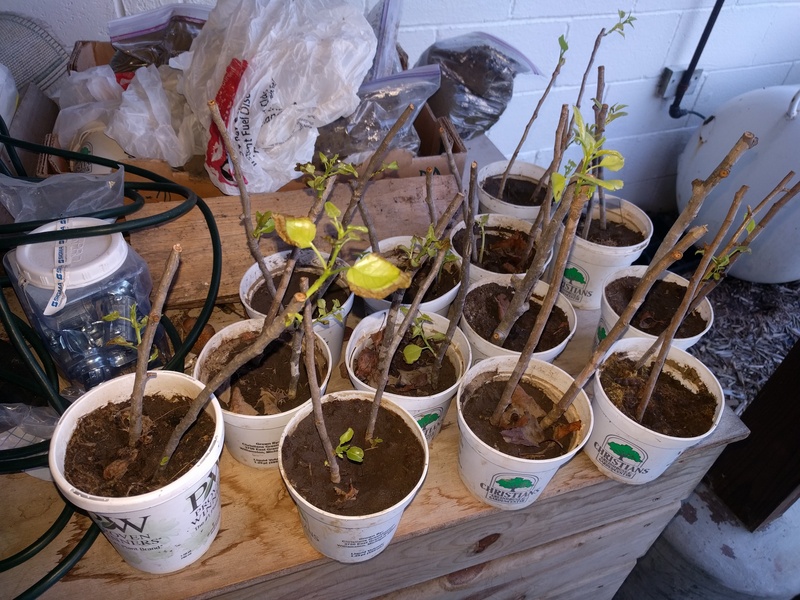 The wood below grade stays dry? Yup it stays dry. It is actually mostly above grade because the back side of the shed has a high granite foundation as the ground drops off away from the house on that corner. There is a lower wood shed behind this shed that the roof caved in about 20 years ago I want to rebuild at some point. I think my uncle said that shed holds about 15 cords. Back in the good old days the upper shed was for the cook stove and the lower one was for heating the house. I want to rotate between the two so I can keep dryer wood all the time. Tom we always just split it and stack it right in that shed. 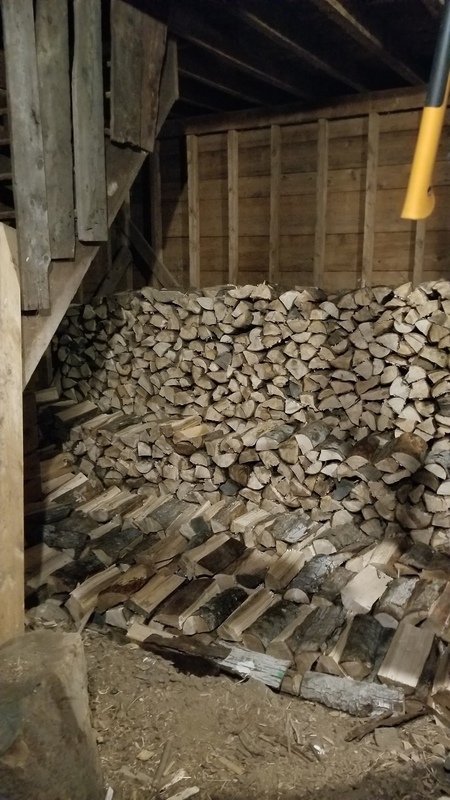 When we put it in the basement we would leave it outside till fall but there is so much airflow in that old shed it actually dries faster being out of the rain all summer. 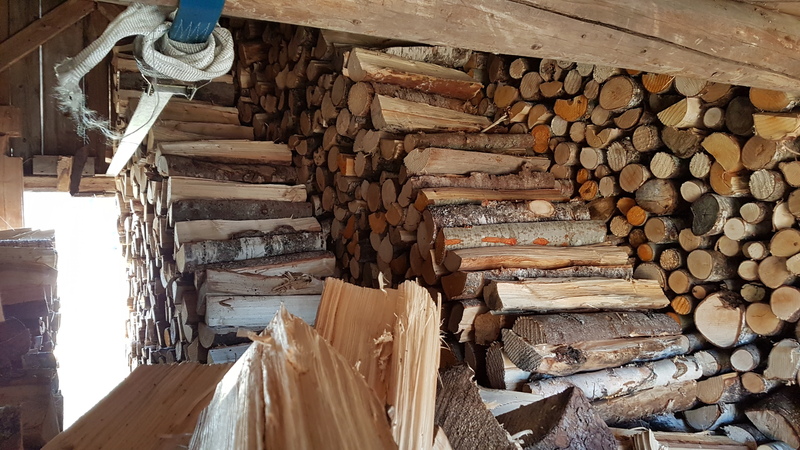 I actually find I handle it less this way saw a pickup load and split it right into the back of my pickup then stack it in the shed and I am all done with that load and the area is clear to roll some more logs off the pile onto my bunks to saw. Also lacking a big dump truck or trailer this is easier. Not as much from looking as doing… but labor is just time insulating and modernizing a 118 year old house is a lot of money I don’t have to put into it… maybe someday when I get rich and famous. 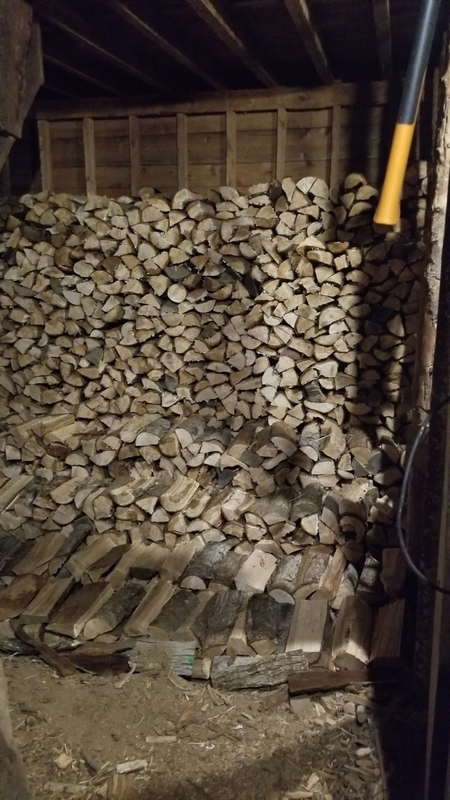 I finished my firewood prepping yesterday. 8 cords cut split and stacked. Another 4 cords remain from last year. 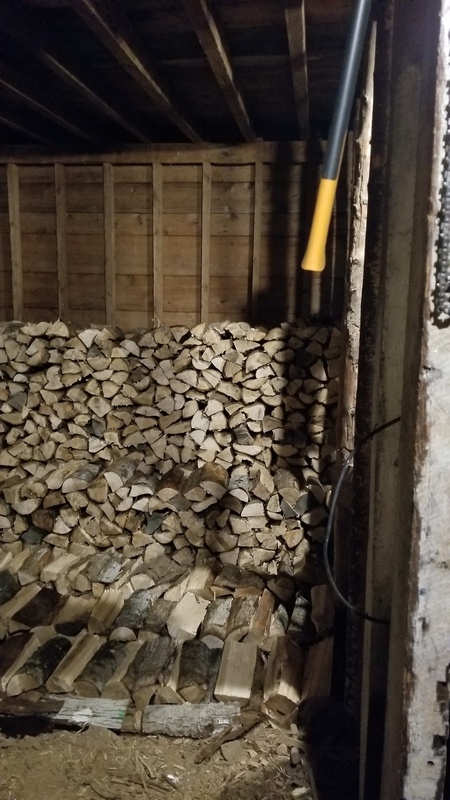 I saved some space in the shed for upcoming slab wood. A stationary bike flywheel happened to fall into my lap. How high did it fall from; did it hurt? Does that make it so you do not have to be so ready with the switch if it stalls? That is awesome I will have to keep working on catching up with you. 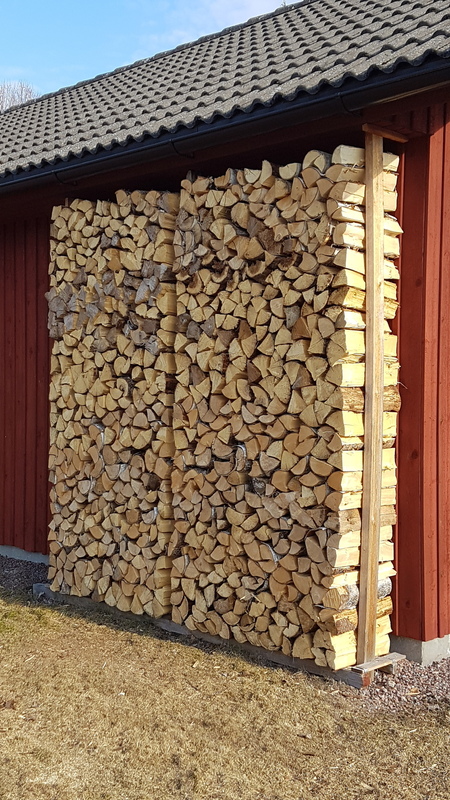 Well you inspired me to go split a second pickup load of wood. 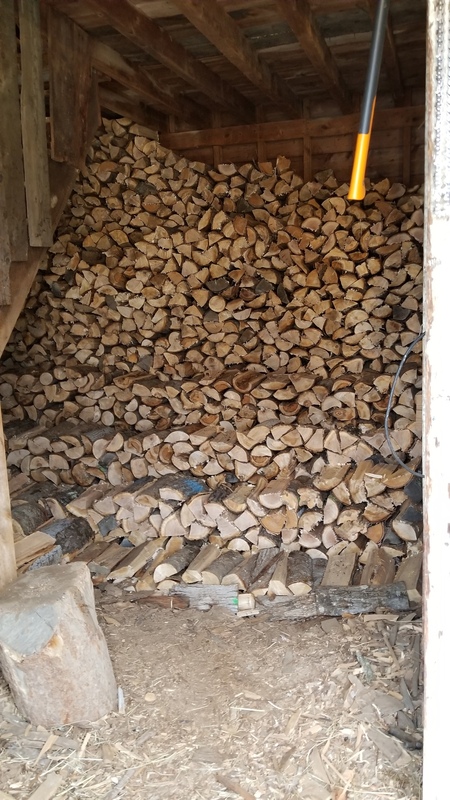 So today I made my grandfather’s goal of 1 cord of wood sawed, split and stacked in a day. It isn’t often I get that much in a single day. If you scroll up you can see the difference one cord makes in my shed it is a big corner to fill. Yes, the flywheel saves on the switch and belt. Pretty much the same here. We don’t have much drifts but open shaded areas in the woods still have foot or two of snow. I finally reached the ceiling today. I had to call the day short at a single pickup load because I have some hay deliveries to deal with but once you get the first row done the shed fills a lot faster. 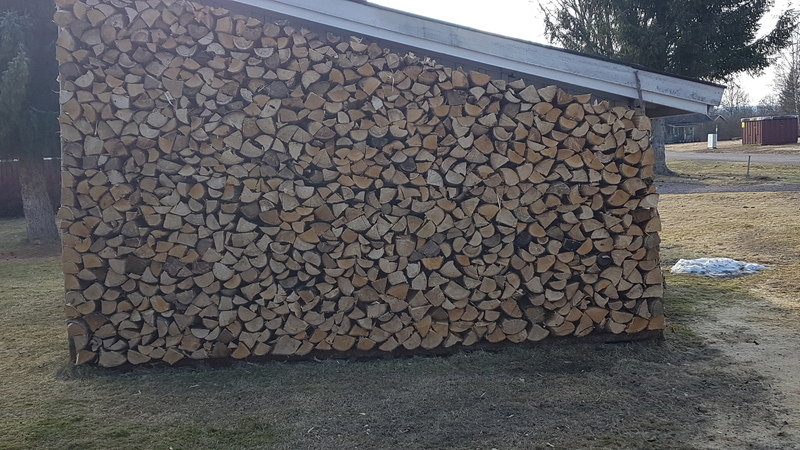 Or atleast each load of wood looks like it does more. Lol. Oh that first row is half way across done all the way to the ceiling the fist 4 rows are twice as long as the last rows. The limbs from this tree got chunked late last summer or fall. The wood in the picture is about a 8 foot section out of the log . It was about 20 inch diameter . I used my wood splitter to get the pieces down to the size the chunker could eat easily.